Capture and Share the World’s Moments – Instagram is a fast, beautiful and fun way to share your life with friends and family. You will receive some instructions on how to use the service along with a list of the valid filters that it supports. For the purposes of this blog post I’m going to use a Digital Ocean droplet to power this service. Please check-out my my previous blog post for instructions on how to spin-up a Digital Ocean VPS with Node.js pre-installed and set-up a non-root user with sudo privileges. Now that your server is set-up you can start to write your app. Start your node app with node . and open up a browser. Visit http://your_server_ip:3000/ and if everything is working you should see the word Phonestagram. Validate that a NumMedia HTTP POST parameter, if present, is an integer that is greater than or equal to 0. Convert that parameter from a String value into an Integer. Will allow, via unknown(), other POST parameters not specified in the schema. The first block of code checks to see that the request to this URL is coming from your Twilio account and not just someone curl-ing from their command line. If the request isn’t from Twilio the method replies with an HTTP 403 forbidden response. Let’s dive into the happy case, that’s where all the fun stuff happens. Download the photo that was sent via MMS to the local temp file system. Apply the specified filter to that local file. Save the resulting file to the app’s static directory. 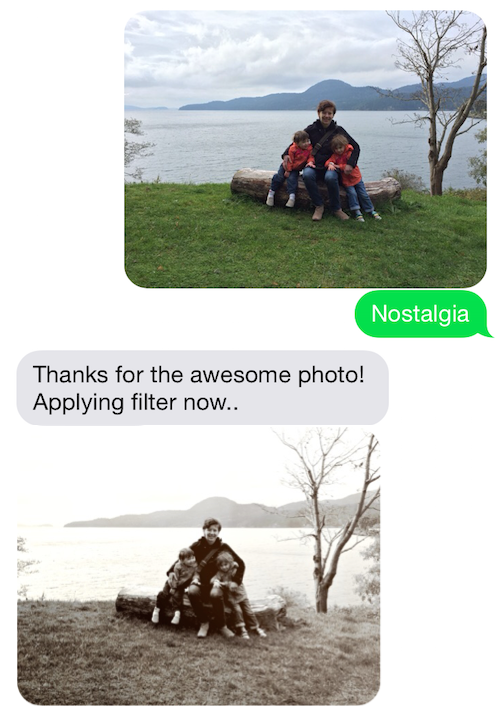 Send an MMS reply to the user with the new, filtered photo attached. Next, hardcode a list of valid filters that users can apply. In the handleMessage method create a twiml object. You will use this to send text message replies to the users. Now, tweak the if statement below to check for filterValid being true. If it is, send an immediate SMS reply to the user letting them know to hang tight. This is polite because depending on the size of the photo or the complexity of the filter it could take some time to get a filtered photo back. The applyFilter method is where the magic happens. It creates a unique UUID which you will use as the filename when you download the user’s original photo to the server’s local file system. You’ll then use the Caman module to apply the filter and save the new file to the static directory, which makes it available to be served publicly. Finally you’ll delete the temporary file. You might notice that the resulting file is being resized down to a width of 600px. This will help ensure that the new file isn’t too big and will successfully get sent via MMS. Feel free to tweak that value to your liking. Now that you’ve got a new photo with an awesome filter applied, it’s time to send it to your grateful user. In order to do that, create an instance of the Twilio REST client towards the top of your program. This is what you will use to send an outbound MMS. The sendPhoto method builds a fully-qualified URL based on the host of the server and the name of the new file. At this point you have built a fully functional Node application that accepts photos and a desired filter, applies the filter and sends the new photo back to the user. Let’s connect it to Twilio and test it out. Log-in to your Twilio account dashboard and click on Numbers. Edit your MMS-enabled Twilio number (US & Canada only) and edit the Messaging Request URL to point to your server’s IP address at port 3000 with the path /message . Click Save. Now, set a couple of environment variables. On your Dashboard, you’ll see a Twilio Account SID and Auth Token. Run the commands below on the command line, substituting your credentials. Boom! That’s pretty rad, huh? Thanks to my amazing wife and daughters for being part of today’s tutorial. However, in order to be an Instagram replacement you still need to make it easy to share/display these news photos with people. Let’s wrap-up this application by building a simple webpage that displays the most recent photo that you’ve taken. The img tag will contain the most recent photo. When the page is first loaded it will simply be blank. The first script tag loads the socket.io library. This will create a real time connection to your Node application and allow you to update the page without a reload. The next script tag defines two event handlers. The first event handler simply prints “Connected!” to the JS console upon a successful connection. The second event handler listens for the server to send a URL for a newly saved photo. A single line of JS does the job of updating the src attribute of the image. Now that your web page is finished, you just need to add some code to your Node app to send new_media messages to the browser when new photos are saved. Open up index.js and add the socket.io module to the project and create an io variable. Restart your Node server and test it out. Load the webpage and then send an MMS to your app. You should see the filtered version of that app appear on the webpage in real-time! The last part of this tutorial involves using LevelDB to store meta data about your photos. LevelDB is incredibly easy to work with in Node and this data will come in super handy if you decided to extend this app and attempt any of the challenges that I lay out at the end of this tutorial. First, require the level module at the head of your app. Installing graphics manipulation libraries on an Ubuntu server. Creating a simple Node web application using Hapi. Processing incoming photos using CamanJS. Receiving and sending MMS messages using Twilio. Updating a web page in real time using Socket.io. Storing data about our photos using LevelDB. The complete source code for this app is MIT licensed and hosted on Github. Feel free to use or modify as you like! Show the last N photos on a fresh page load. This will require pulling the photos out of LevelDB in Node and passing these images to the webpage when it loads. Restrict photos sent to the public website to a whitelist of phone numbers. After all, you don’t want just anybody to be able to update your awesome Phonestagram website, right? Ok, that’s it. I hope you enjoyed this tutorial on building your own Instagram clone. If you tackle any of the challenges above, definitely post your code on Github and let me know about it (@crtr0 on Twitter). Happy hacking!